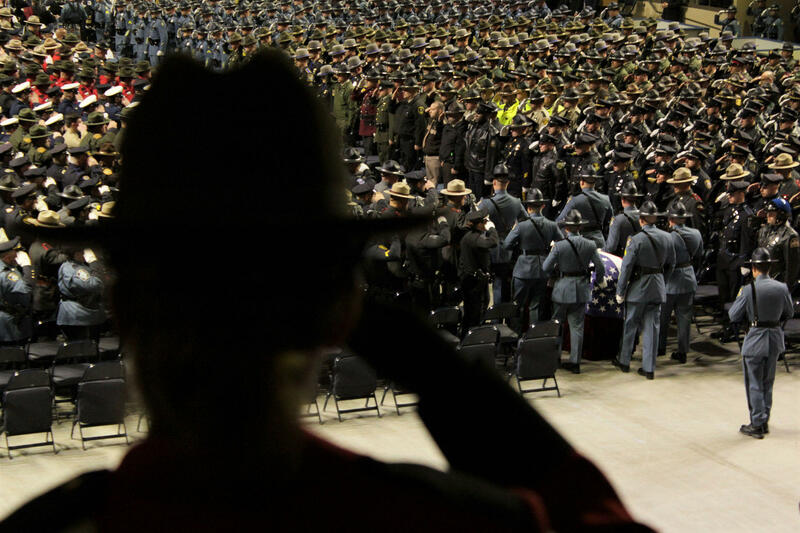 State police troopers stand as Detective Ben Campbell's funeral procession passes in Portland on Tuesday. Portland firefighters stand at attention as Detective Ben Campbell's funeral procession passes on Spring Street in Portland on Tuesday. A flag hangs over the funeral procession for Detective Ben Campbell on Spring Street in Portland on Tuesday. Friends, family and fellow law enforcement officers have been grieving all week for state police Detective Ben Campbell, who was killed last week in a freak accident after stopping to assist a stranded motorist on I-95. They turned out at the Cross Insurance Arena in Portland on Tuesday to say farewell to the husband and new father who would have turned 32 on Monday. 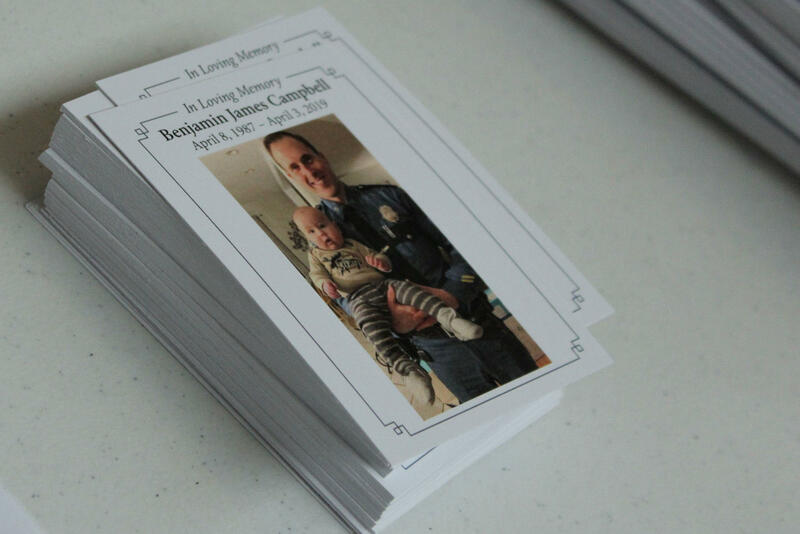 Cards at Detective Ben Campbell's funeral in Portland on Tuesday. Cote said Campbell had the ingredients that go into a great trooper, ones they don’t learn about in training. “At Ben’s very core was a cornerstone of integrity. A foundation of selfless service. Sacrifice,” he said. 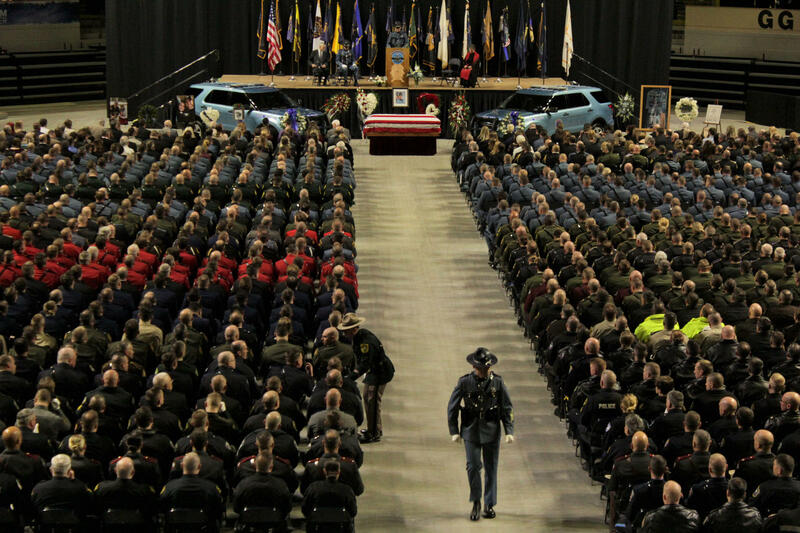 Law enforcement officials salute as Detective Ben Campbell's casket passes at his funeral in Portland on Friday. “He understood, just because he was arresting someone, did not make that person a career criminal. Ben would talk to these folks, and through those conversations, he would learn that, many times, the conduct that led to their arrest was simply the result of problems and circumstances within that person’s life,” he said. “We struggle in our thoughts to make some sense of this tragic accident, while our hearts have a gaping wound, once filled by the presence of a husband, a father, a son, a brother, a friend, a colleague,” he said. Thousands gathered for Detective Ben Campbell's funeral in Portland on Tuesday. Campbell’s widow Hillary also spoke. She told the crowd to slow down and appreciate the important things in life every day. She received a standing ovation at the conclusion of her remarks. About 3,000 people, many police from all around the region, attended Campbell’s service. Originally published 7:10 a.m. April 9, 2019.